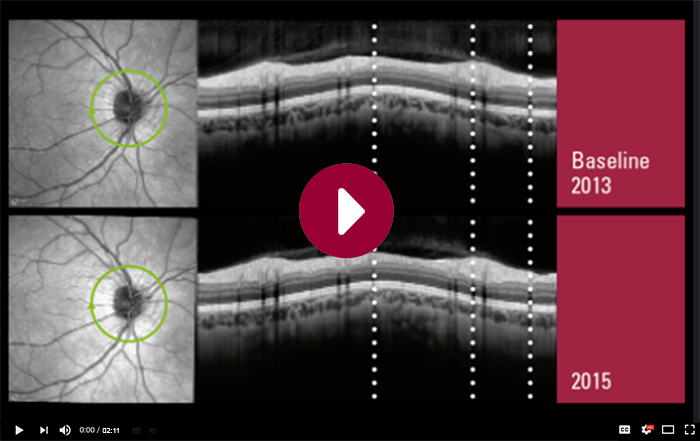 For retinal nerve fiber layer thickness (RNFLT) measurements, the correct anatomic alignment of scans according to the fovea-to-Bruch’s membrane opening center is critical. Head tilt and natural eye movement can cause scan alignment artifacts that may lead to a negative impact on the diagnostic accuracy and can also significantly impact follow-up scans. A study compared the misclassification of RNFLT measurements due to head tilt on both a Heidelberg Engineering SPECTRALIS® SD-OCT and a Zeiss Cirrus® SD-OCT.
Find out how head tilt and eye movement can affect retinal nerve fiber layer thickness measurements depending on the imaging system used. Learn more about the SPECTRALIS DNA and how it facilitates reliable follow-up examinations to ensure consistent RNFLT measurements over time.